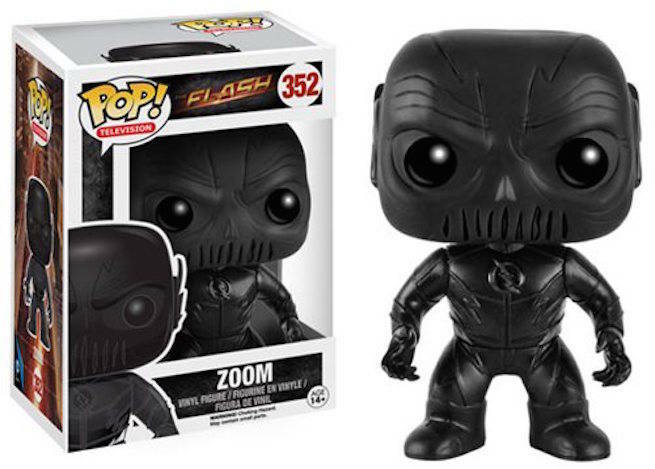 Funko has released promotional images of their latest wave of Arrow and The Flash vinyl pop figurines. Featured in the lot is Zoom -- the Season Two big bad on The Flash, played by Teddy Sears. It's kind of unusual to bring a character like him to action figure form JUST as he's being seen off the series, but who knows? Maybe in spite of Sears having a major role on another show next season, Zoom will make a cameo for an episode or two. Of course, that's still more timely than the other new Pop -- a metallic variant of Deathstroke, the Season Two big bad for Arrow. The character is going to have a new #1 from fan-favorite writer Christopher Priest as part of DC's Rebirth initiative, though, and a futuristic version of him (the original's son) appeared on one of the most popular episodes of DC's Legends of Tomorrow Season One, so it's not entirely random. Given the time-travel shenanigans involved with the season finale of The Flash, Deathstroke may show up there next season, too. You can pick them both up at Entertainment Earth, or check your Previews catalog. Both Arrow and The Flash are now on hiatus, with their final new episodes airing this week. They'll be back in production in July for a presumptive October debut on The CW. In the meantime, expect plenty of news to come out of Comic Con International: San Diego this summer, where they revealed the big bad of The Flash last year during the DC TV presentation in Hall H.